British office John Glubb had an adventurous career as commander of the Arab Legion during and after World War II. Serving as a district officer, Glubb went far beyond his expected duties. He became enthralled with the Bedouins and their life, mastering their language, customs, and lore as perhaps no other Westerner had done before. He traveled hundreds of miles on camelback, subsisted on bread baked over an open fire with rancid sheep’s butter, and used a rock for his pillow. “Only those who have experienced them can understand the joys of evening in the desert, seated in a circle round the campfire in the clean soft sand, beneath the sparkling Arab stars or in the still white light of the full moon,” Glubb wrote. In 1924, Ambassador Sir Kinahan Cornwalis convinced Glubb to resign his commission in the British Army and devote his life to the Arabs. In November 1930, after a decade in Iraq, he contracted into the military service of Transjordan, with which he was to be famously identified for the next quarter century. A sandbox-size kingdom carved out of northern Arabia and territory east of the Jordan River adjacent to Palestine and ruled by Faisal’s brother Abdullah, Transjordan was completely dependent on British support. By 1930, when Glubb entered Transjordan’s service, it was clear that British troops could not cope with raiding by the tribes and by fanatical Ikhwan from Saudia Arabia in the 28,000 square miles of trackless desert making up 75 percent of the kingdom; even less equipped to do so was what passed for Transjordan’s own security force. Well-armed members of the Arab Legion guard a fleet of British Gloster Gladiator biplanes during the Iraq campaign in World War II. Some 250 legionaries took part in the campaign. Glubb spent his first three months traveling the desert by truck among the camps of the Howeitat tribe, “the wildest and most anarchic tribe I had yet met.” Glubb recommended that the king withdraw British forces and enlist native Bedouins into the Arab Legion, with their own unit patrolling the desert. The Howeitat, although initially suspicious, quickly filled his mandated force of 90 men, with a long waiting list of sheiks’ sons. Soon, Glubb and his followers had eradicated camel theft and cross-border raiding. 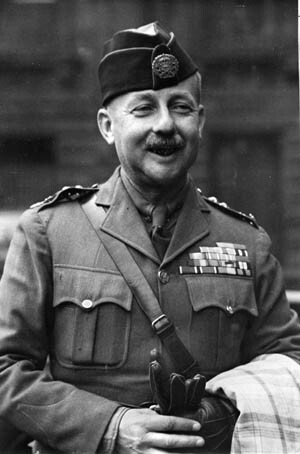 When the Arab Legion’s founder, Colonel Frederick Peake, retired in March 1939, Glubb was the obvious choice to succeed him. When he took command, the Arab Legion numbered 1,350; Glubb would build it up to 23,000, turning a police force into the best Arab army in the Middle East, attracting Bedouin from all over the region. This would prove crucial when World War II broke out a few months later. Wondering if the Arab Legion would invade a neighboring Arab country to topple a pro-Nazi regime in Baghdad, the British commander in Palestine, General Sir Henry Maitland Wilson, asked Glubb, “Will the Arab Legion fight?” “The Arab Legion will fight anybody,” was Glubb’s confident reply. He led 250 legionnaires in a successful invasion of Iraq, then helped to drive the Vichy French from Syria. To Glubb’s disappointment, the Iraqi and Syrian campaigns, despite the praise his Bedouin received, would be the Arab Legion’s only action in World War II. “I still believe that the Arab Legion might have played a role of considerable importance in Northern Africa in 1942,” he wrote bitterly after the war. If he didn’t blame the Jews, Glubb still was prepared to make war on them, building the Arab Legion, which had fallen from its wartime peak of 16,000 to 4,000, back up to 7,000 men. At same time, he secretly sent a subordinate, Colonel Desmond Goldie, to meet with Jewish officials to peacefully arrange partition when it came and keep both sides out of Jerusalem. But when the Jews declared statehood including Jerusalem, Glubb, remembering his pledge of loyalty to Transjordan King Abdullah, sent the Legion into action against the new state of Israel on May 15, 1948. The Arab Legion, along with fellow Arab guerrillas, immediately overran the key Jewish kibbutz of Kfar Etzion in brutal hand-to-hand fighting. The Legion protected four surviving defenders, treating them as POWs. Two days later, a direct order came from the king to attack Jerusalem. Legionnaires cheered the news, but Australian Colonel William Newman was in tears. “They’re sending my Bedouins into a fight they are not trained for,” he told Glubb. Events would soon prove Newman right. It took the Arab Legion 10 days to conquer the few square blocks of the Old Jewish Quarter in East Jerusalem against 200 lightly armed defenders. “Hand-to-hand fighting took place from house to house and from room to room,” wrote Israeli General Chaim Herzog. The quarter surrendered when there were only 36 defenders left standing and only 300 bullets among them. As at Kfar Etzion, the Legion’s ranking Arab officer, Major Abdullah Tell, urged his men to let their professionalism prevail over their hatred, holding off screaming Arab mobs with rifle butts and warning shots to evacuate the quarter’s 1,200 residents and carry the wounded on stretchers to the Israeli lines. In the meantime, a convoy of armored cars led by Major Robert Slade was driving on the New City in West Jerusalem when a Molotov cocktail set the lead car on fire and blocked the way, forcing the other cars to reverse up the narrow streets. Some 200 legionnaires under Lieutenant Ghazi el-Harbi, a Saudi, fought their way onto the grounds of the Convent Notre Dame de France, less than a half mile from West Jerusalem, only to be pinned down under murderous fire. After the Legion force had suffered 100 casualties, Glubb ordered a retreat. Glubb moved to shell and starve the Israelis into submission, cutting the Jerusalem Road at Latrun. The Legion threw back three desperate Israeli assaults up the ridge, once throwing in hastily armed clerks, signalmen, and cooks. Finally, the Israelis cut a new road through the hills out of Legion artillery range to open the supply line into Jerusalem on June 11, 1948. Glubb managed to keep the Legion operating with 16 retired British officers under contract, but the ammunition shortage soon brought him into conflict with the Transjordan government. “Don’t shoot unless the Jews shoot first,” was all Prime Minister Tawfiq could lamely advise. In more heated exchange, Tawfiq demanded: “Don’t you know financial regulations? Where am I to get the money to pay for what you have overspent?” “I suggest you deduct it from my pay,” Glubb retorted. After months of static fighting interrupted by repeated U.N. truces, Transjordan and Israel signed an armistice on April 4, 1949. The Arab Legion had suffered 20 percent casualties and had made the only strong Arab showing in the war, capturing East Jerusalem and the West Bank of the Jordan River, which was annexed by Abdullah to form Jordan. In the end, it would not be enough to save Glubb’s career. The man who prided himself on understanding Arabs failed to see what an anachronism the sight of British officers commanding native troops had become in the new era of Arab nationalism. King Abdullah’s assassination in 1951 robbed Glubb of his long-time patron, and the 30-year age gap with the king’s grandson, Hussein, inevitably created tension. Glubb did himself no favors by objecting to the use of Jordanian territory for guerrilla attacks on Israel and repeatedly postponing when Jordanians could take full charge of their own military. Glubb protested, pointing out that he had a family and a lifetime’s possessions to consider. He and Sameer settled on 7 o’clock the next morning. Glubb’s wife took it in stride: “We’ll have some tea now. Then I’ll put the children to bed early, and we’ll pack all night.” Only the British ambassador, the minister of defense, and a few others were present to see Glubb off. The Royal Chamberlain gave Glubb an autographed picture of the king. “In a few hours, twenty-six years of work had been destroyed,” Glubb wrote. The 64 British officers then serving with the Legion followed within a few days, and the break was completed with the Arab Legion being renamed the Jordan Arab Army. Glubb never complained about his dismissal or criticized Hussein for it. Given a knighthood from the British government, he supported himself by writing and lecturing on his career in the Middle East. King Hussein quietly provided Glubb with some badly needed financial support in his last years and ignored widespread criticism among his fellow Arabs when he decided to attend Glubb’s memorial service at Westminster Abbey in 1986. Tags Arab-Israeli War, british military history, General Maitland “Jumbo” Wilson, John Glubb, Jordan, King Abdullah of Jordan, King Hussein of Jordan, Lawrence of Arabia, Selwyn Lloyd, Syria, United Nations, WWII.